There has been many changes to OneDrive over the years and across the different Microsoft Windows versions; from Windows 7, to Windows 8 and 8.1, and now Windows 10. However, one thing has remained the same, OneDrive’s inability to work on removable drives right out-of-the-box. We were able to overcome this in Windows 8 with this earlier tip. The main reason is because your computer or tablet has limited space, generally between 64GB and 512GB. This system drive is typically a lot faster than removable drives, so it is better used for applications. However, once you install your necessary (and unnecessary) applications, like Microsoft Office, Adobe Photoshop, Minecraft and a myriad of other programs; your available free space gets fairly small for your own personal data, like documents, pictures, music, videos, and other files. This is where OneDrive’s cloud storage and a large removable drive can work together very well. For example, I practically doubled the storage on my 128GB Microsoft Surface Pro 3 with a new 128GB micro SD card inserted behind the kickstand. Here’s the one I’m using from Amazon. So here’s how to get around it in Windows 10 (thanks for the tip Brian!). If you’re a tech geek, format your removable media as NTFS, create a dynamic virtual hard drive on it, and point OneDrive to the virtual hard drive. If you’re not (yet) among us tech geeks, below is a step by step guide on how to get OneDrive to sync data to the removable drive. I have broken the major steps into multiple pages to make it easier to follow (unlike my earlier super-lengthy article on How to Sync SkyDrive to a Removable SD Card in Windows 8). Once done, OneDrive works as it would with a regular drive. You can directly work on the files and move them to and from the OneDrive folder fine. 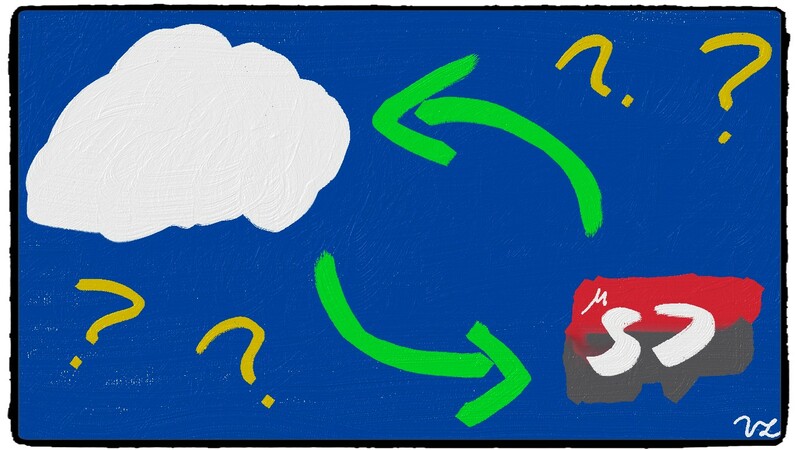 OneDrive synchronizes the files to and from the cloud fine as well. One major concern is, “What if I remove the micro SD card?” Well, if you remove it while it is actively reading/writing, then you may corrupt your data. 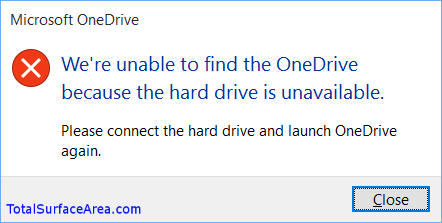 This would happen to any removable drive whether it is connected to OneDrive or not. Because OneDrive does a lot of file syncing in the background, it is hard to know whether it is active or not. Therefore, do not remove the micro SD card or USB drive without right-clicking the drive and ejecting it first. If you remove it after properly ejecting the drive, it should be fine. I have had to remove my micro SD card a few times to access other micro SD cards from my Windows Phone and cameras. Here’s what happens when you do. Below is a screenshot of the micro SD card removed on my Surface Pro 3. Now, if you try to access your OneDrive, you would get a “Location not available” and/or an unable to find OneDrive dialog box(es). Once I inserted the micro SD card, the drive appears in File Explorer. Trying to access OneDrive now would yield the same one or two “Location not available” and/or an unable to find OneDrive dialog box(es). Unfortunately, this does not only happen when you remove the drive, it also gets disconnected after a system restart. Luckily, OneDrive works fine after putting the computer to sleep or shutting it down. So to get OneDrive to work again after a restart, you would have to remount and reconnect as shown in Step 4a: Re-Setting Up One Drive. Hope this works for you. Let me and others know in the comments if you guys find a better way. Thanks! There is a way to prevent the unlink in every restart. It is a bit tedious, but one can set up a task to mount the virtual disk via Diskpart, then a delayed start up for onedrive (disable onedrive on startup first). It works. I can post the script if interested. I Bing’d it and there lots of examples, but I could only get the Diskpart one to work. Very interested to try this method. Some reason when doing Windows Updates in Windows 10 it is not allowing this install after shutdown/power on. It still tells me to restart PC, which removes the mounted drive of course and the whole sync process again. If you could please let me know how to do this I would like to try it out and see if it works for me. Thank you! Brian, These are well done instructions. In the IT biz, I know great user guides when I see them! Nice job. Thank-you sooo much for this! Excellent instructions! I have the same question as someone else in here. I’m a bit confused. Since my files are now set to go to the Virtual Drive; and uploaded to One Drive; does this mean that the files are not stored locally on the sd card or does it go to both? With today’s release, OneDrive now supports syncing to removable media on Windows 10, 8 & 7. When setting up your OneDrive, you can choose a removable media target for your files. I have the Windows 10 1511 update and I don’t see that option available to me. When setting up OneDrive it just shows files to sync and that it is saved to C drive and no option to change. Okay I figured it out. I forgot to move the original OneDrive folder from the File Explorer to th external drive. Thank you. do we still have to create a VHD on the SD card? or will this be taken care of now with the renewed support? Could you please elaborate on how this is done. I do not see any options for this when setting up the new OneDrive client. Also You apply the same about the VHD if you use a USB?. Thank you for this post is very useful. Very well done instructions, thank you. However, it seems that the auto-mount problem is still real in September, 2017. Or at least I have not found something in Windows 10 to auto-mount the VHD and sync OneDrive. Anyone have an update on this? Or do I still need to use scripts to auto-mount the VHD and delay the One Drive at startup? Thanks! Thank you SO much for such wonderfully straightforward and well explained step-by-step instructions. It is working and is exactly what I wanted to do when I purchased a new SD card. Thanks for the great instructions, they were really easy to follow. As an addition / replacement of part 4a you could look at the simple method of auto mounting that is set out in this webpage.